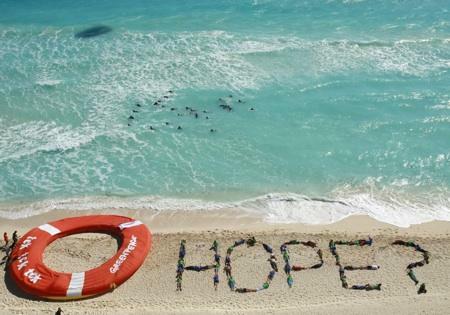 Greenpeace activists form the word hope as a question with their bodies, next to a giant life saver, during a demonstration near the site of the United Nations Climate Change Conference in Cancun, Mexico, Friday, Dec. 10, 2010. It was time to put up or shut up. Delegates to the United Nations climate conference in Cancun knew if they came out of the talks empty-handed, the whole effort to reach a global warming treaty could collapse. The agreement that emerged over the past weekend made just enough progress to keep the talks alive for another year. The end result fell far short of what’s needed to stop climate change, and major areas of disagreement weren’t even touched. But given the low expectations going into the conference, the Cancun agreement does provide badly-needed momentum for a U.N. process that was in danger of sputtering out. James Dailey is a Seattle-area businessman and a board member of Climate Solutions, a regional environmental group that focuses on global warming. He told me on the last day of the conference that he’s optimistic because he’s seen how business is bringing serious resources to the climate change table. “Surrounding the negotiations, I counted at least five separate business gatherings that had the likes of Nike, Coca Cola, Duke Energy, Wal Mart, coming here and sort of recognizing, this is the future, they need to et on board. They see the writing on the wall, and they see opportunity, as well,” says Dailey. The opportunity to cash in by investing in the technologies that could become the light bulb, or the telephone, or the internal combustion engine of the 21st Century. Dailey says that society gets to re-engineer the energy sources that are the foundation of the economy only once every couple of centuries or so. Dailey says national governments may find themselves being forced to develop climate policy just to keep up with realities in the marketplace. The federal government will also have to come to terms with a growing number of regional, state and local climate initiatives. Stuart Clark is with the Washington Department of Ecology. I caught up with him between meetings in Cancun. He told me that many government functions touched by climate policy are state or local responsibilities, anyway. “Like land-use changes, and transportation decisions, building and zoning decisions, and energy distribution, waste management. Those are primarily local decisions.,” says Clark. Clark points to the Western Climate Initiative: seven western states including Washington and four Canadian provinces that are developing their own climate policies. It’s one of three regional efforts in the U-S, which involve 24 states. Clark says such programs like could prove to be a model for when the federal government is ready to move forward with national policies. A lot of airtime and ink goes into tracking the ins and outs of climate politics in Congress or the U.N. But it may be that -- while those flashy dramas are playing out on the media stage -- profound shifts are quietly talking place on the ground. And as home to innovative companies and trend-setting policies, the Pacific Northwest is positioned to play a key role in that future.